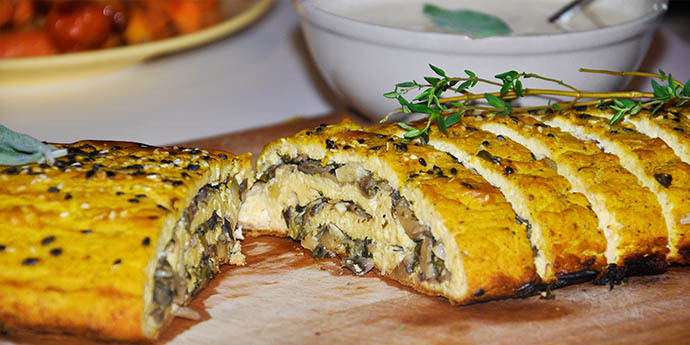 This tofurkey roulade with mushrooms is a great vegetarian recipe even your omnivore friends will love! This is perfect for both Christmas and New Year's Eve! Mash tofu using a fork or your hands. Put tofu in the food processor (you may need to divide it in two and process separately) and process until crumbled. You don't need to over-process it, just enough to crumble it, not turn it into a paste. Mix in beaten eggs and flour and set aside. Do not add salt if tofu was preserved in salty water, as it is salty enough already. Add onion and garlic. Saute for 2 minutes. Add chopped mushrooms, white wine and condiments. Cover with a lid and cook for 10 minutes. Remove lid and add the rest of the ingredients, except egg. Cook for another 5 minutes. Remove from heat and add beaten egg. Mix. Move crumbled tofu from the food processor into a large bowl. Cut a 40cm piece of aluminum foil or parchment paper and place it on your table. Grease it with some oil. Add a layer of tofu (1-1,5cm thick) all over the aluminum foil/parchment paper. Leave a 3-4 cm margin. Cover with another layer of stuffing, all over the tofu layer. Now start rolling slowly. The aluminum foil will help you roll the roulade (Be careful not to roll the aluminum foil into the roulade! It should remain on the outside only.) The role of the aluminum foil/parchment paper is to simply help you roll the roulade easily. It will be removed afterwards. Put the roulade on a parchment lined oven tray. Brush with the coating sauce mix. Bake in the preheated oven at 190C for 40 minutes. Serve with sauce - either vegan gravy with white wine or sour cream sauce.